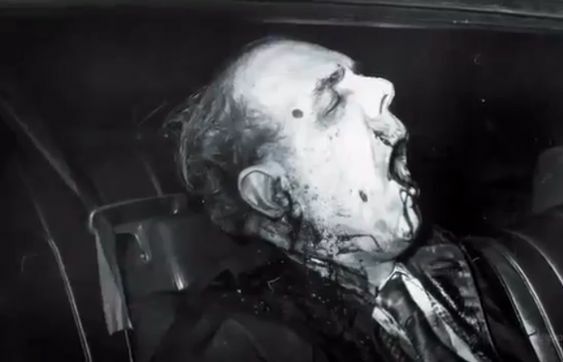 Angelo Bruno, whose reign as Philadelphia mob boss ended with a shotgun blast to his head in 1980, is experiencing a posthumous resurgence. The "Gentle Don," as Bruno is sometimes known, surfaced on the big screen last year, played by actor Chazz Palminteri in Legend, the British gangster film starring Tom Hardy. Philadelphia filmmaker Tigre Hill is wrapping up his appropriately titled organized-crime documentary, The Corrupt and the Dead, that will feature Bruno and other mob bosses. And now Bruno's old Snyder Avenue rowhouse - where he was murdered at age 69 - has been nominated for official landmark status with the Philadelphia Historical Commission. Before you ask, yes, it certainly would be unusual for a city to recognize a building associated with a major La Cosa Nostra figure who was part of a crime syndicate that President Reagan called a "stain" on American history. But this is Philadelphia. Sometimes we wear our stains on our sleeves. "We're crazy enough to do it. Why not?" asked historian and South Philly mob watcher Celeste Morello. Morello, herself a relative of New York mafiosi, said she nominated Bruno's three-bedroom home at 934 Snyder for a spot on the city's Register of Historic Places because his criminal activity helped shape federal laws and strategies for fighting organized crime. "If Bruno didn't do things to make law enforcement notice him, I doubt that Philadelphia would have been one of the first organized-crime law enforcement units with a 'strike force' in the country," Morello said. The nomination is expected to be taken up next month by a committee of the Philadelphia Historical Commission. "I assume it is our first historical property nomination related to Mafia history in Philadelphia. I can't think that there is another one," said Kim Broadbent, historic preservation planner on the staff of the Historical Commission. "It's certainly a unique story about Philadelphia's history that we don't typically come across at the office." Reaction to the nomination has been . . . mixed. David Fritchey, the recently retired chief of the Organized Crime Strike Force in the U.S. Attorney's Office, burst out in laughter last week when the Daily News informed him that Bruno's house could become a landmark. "That's a little unorthodox," he said. "It's not like he was William Penn or Ben Franklin." Bruno, who ran the Philadelphia mob through the 1960s and 1970s, was a shrewd businessman with a reputation for preferring diplomacy over violence - at least compared with bloodthirsty Nicodemo "Little Nicky" Scarfo, who took over as mob boss in 1981. "That's sort of like saying the Visigoths were nicer than the Huns," Fritchey said of Bruno. "He had his share of bodies." Morello, who wrote the 2005 biography Before Bruno and How He Became Boss, said the nomination of a mobster's home might be a national first. Damaris Olivo, spokeswoman for New York City's Landmarks Preservation Commission, said the city has some landmarks associated with unsavory characters "but that's not the reason why they were designated." Peter Strazzabosco, deputy commissioner of Chicago's Department of Planning and Development, said its city council had given landmark status to buildings affiliated with gangsters such as Al Capone (the Lexington Hotel) and John Dillinger (the Biograph Theater). But, as in New York, those mob ties didn't play a role in the designation, he said. "A person's affiliation with the underworld is not considered a significant contribution to the development of the city," Strazzabosco said. Fritchey said Bruno's reputation as a peacemaker is sometimes exaggerated. He wasn't always so gentle. "He was more discreet about murders than Scarfo. Scarfo was an in-your-face killer. He wanted the bodies to be found so people would know he was killing people right and left," Fritchey said. "Bruno had the confidence, as lord of the underworld, that people would be afraid of him without it being so obvious." But disc jockey Jerry Blavat (a.k.a. the Geator and the "Boss with the Hot Sauce"), said he spent "many wonderful evenings" on Snyder Avenue with Bruno and his wife, Sue, and considered it "just another Italian home," with family streaming in and out. "That house was very warm and I have a lot of great memories, having coffee with Angelo and Sue. Christmas dinner, Christmas Eve nights, it was basically an open house," Blavat said. "That's the way that home was." As for criminal activity - organized or otherwise - the Geator says he never saw anything. "There was no activity, other than just family and friends and neighbors," Blavat said. "That's all I saw." On the night of March 21, 1980, Bruno was shot and killed while sitting in the passenger seat of a car parked in front of his house. His last meal was chicken Sicilian and rigatoni marinara at what was then Cous' Little Italy at 11th and Christian. Bruno's driver, John Stanfa, was slightly injured by shotgun pellets. He went on to become mob boss around 1989 and is widely believed to have conspired in the Bruno hit. Stanfa, 75, is serving a life sentence for a 1995 federal racketeering conviction that included murder, gambling, and extortion. But he was also a stonemason and did some of the brickwork at 934 Snyder, as Morello noted in her nomination. Bruno's daughter, Jean, still lives in the house, where she recalls family New Year's parties in the basement bar and singing with her father as he played piano. In a 2010 interview, when the house was first placed on the market, Jean Bruno told the Daily News: "Every time I come out of this house, I see the very spot where he was killed." Yesterday, Jean Bruno said those memories have faded. "I realized my father wouldn't want me to have those bad feelings. That helped me," she said. "Now I don't think of it." She supports Morello's effort to have the house made a landmark. "I think it could only increase the value of it," she said. As for her father's day job, Bruno is sticking to her story. "He was never convicted of a felony. He kept the drugs out, for crying out loud," she said. "He would put flags out and say, 'This is the greatest country in the world. I wouldn't want to live anywhere else.' "
Of course, the neighborhood has changed over the years. The local economy is mostly auto-body repair, cheap cellphones, corner bodegas, and check-cashing. And the Bruno house is a fixer-upper, to put it mildly. Fritchey, the former mob prosecutor, didn't sound particularly enthused about the idea of a crime boss getting his own landmark. "I don't know. Look, he was a capable guy. There are lots of capable people. He happened to be a criminal," Fritchey said. And if Bruno had lived another year, he might have died in jail instead of in his car. The feds were preparing a racketeering indictment at the time. The indictment came down in February 1981. It referred to Bruno as "the boss." "The indictment didn't charge him," Fritchey said, "because he was killed."